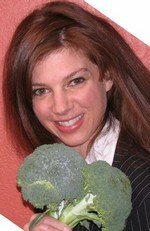 Nutritionist Suzette Kroll, RD, is a well-regarded expert in the nutrition field. She is a registered dietitian, certified intrinsic coach and specialist in nutritional counseling. Suzette is a private practitioner in Tucson, AZ, as well a senior staff member of the world renowned Canyon Ranch Health Resort. Suzette's advice has been seen in Seventeen Magazine, Mindful Mama Magazine,The American College of Sports Medicine Fitness Journal, Weight Watchers online, and on various cable and television stations, including the Food Network. She is a member of The American Dietetic Association, The National Physique Committee and The International Natural Bodybuilding Association. Suzette specializes in weight loss, gastric band weight loss surgery, sports nutrition, nutrition relating to heart disease, diabetes, vegetarianism, and teen and collegiate eating. Leading by example, Suzette is both motivational and inspirational, relating effectively to women and men from all walks of life. Hi, I'm Suzette Kroll. Thanks for checking out my site! I hope you'll allow me to be your personal nutrition guide. Use the site at your leisure to gather information. If and when you think you might need some one on one support, please feel free to contact me! Read more about what you can expect in a visit with dietitian Suzette Kroll, RD.